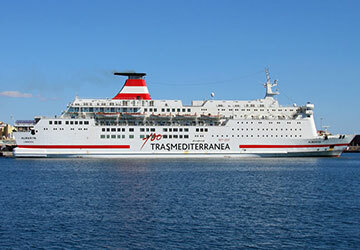 The Almariya is part of the Trasmediterranea fleet and carries up to 1,865 passengers per crossing. The vessel measures in at 154 metres in length and is 24 metres in breadth, meaning passengers can enjoy plenty of space whilst onboard. 400 vehicles can be transferred at a time on the Almariya with the liner reaching speeds of 20 knots. 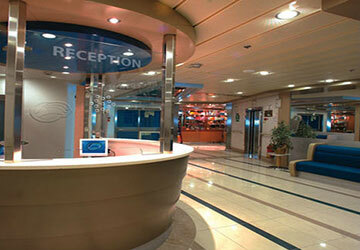 There are facilities aplenty for passengers onboard the Almariya. Cosy cabins are available and a number of different eateries and bars are featured to help you indulge whilst making your journey. With Wi-Fi for public use you can also stay connected whilst on your travels. Cabin accommodation is available for passengers travelling on the Almariya, all containing toilets and showers, as well as comfortable beds to help you lie back and relax on your travels. You won’t struggle to find a dish that suits you with plenty of culinary choices. The self-service counter has a huge variety on the menu and has halal products to pick from. A coffee shop and pub area are also available, so no matter what beverage choice you are after, it’s catered for. Duty free shopping is available for travellers to enjoy with cheaper than high street prices. The usual newspapers, magazines, books and puzzles are in stock to help while away the hours. 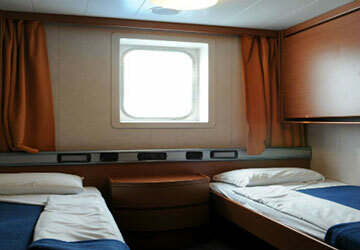 There are a number of additional amenities onboard for voyagers to take advantage of. Commuters won’t have to lose touch with family and friends as Wi-Fi is available for public use. If you choose to travel with your furry friend, there is a Pet Kennel for your pooch. 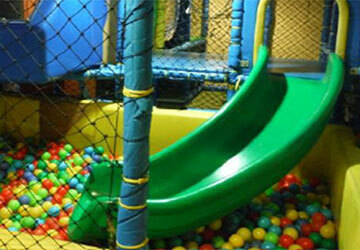 The ship is well catered for those travelling with young children. There are changing facilities, including a diapering area for babies and toddlers. There are impressive accessibility measures in place on the ship. 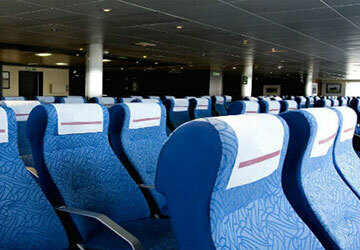 Cabins, toilets and ramps are available for passengers with restricted mobility. Elevators also take travellers between decks. Please Note: Whilst we have taken great care in making our Almariya guide as accurate as possible, onboard facilities, services and entertainment may vary depending on the date and time of year that you travel, facilities mentioned may change without notification and ferry companies reserve the right to operate vessels other than those mentioned at time of booking without prior notification.